On March 16, 2006, it is inaugurated in Xerta the first five-star hotel in Terres de l’Ebre. That establishment is located in the old building known as “millionaire home“, a natural man from Xerta who made a fortune in Argentina. Jaime Martí Tomàs was born on March 27, 1844. It was the second of six brothers. His father, Juan Antonio Marti Cases, pattern river was river trader. The main product of his business was wheat, which is why he was known as “Ceremines”. Jaime grew next to the family business, but when his older brother was married the parent company was for him. In fact, this business could not live more than one family, so three of the brothers, Jaime, Ramón and Fernando, they decided to leave. They chose to travel to Argentina because the news about the Catalans who had emigrated were quite positive. Thus the story of the “Americans Xerta” begins. Initially (1870) settled in Buenos Aires. The first business was the three brothers and had the name “Martí Brothers”. The company traded in various food products from the Peninsula to Argentina: olive oil, olives, preserves, wines, spirits, etc. Over time each of the brothers founded other fully independent businesses. Ramon returned to Xerta and bought the house that now belongs to the family Blanch- Navarro, known as “Ceremines” home. Fernando always resided in Argentina and paid remodeling bell tower from Xerta in 1910. As regards Jaime, during his stay in Argentina he met other Catalans who, like him, had gone to seek his fortune. With some of them created new businesses but also participated as a shareholder in several banks and insurance companies and acquired properties and farms in Bahia Blanca, a city south of Buenos Aires. Thus, it can be deduced that met the commercial prospects corresponding to the Catalan bourgeois who settled in different parts of Latin America in the nineteenth century. In 1871 Jaume married a noblewoman, Maria Dolores de Còdol Tomàs, Baroness Còdol. With this wedding ce met all the requirements for success: a merchant and entrepreneur related to the Catalan nobility. Jaime divorced to the baroness in 1897 without having children. Later, during his stay in Argentina he met a uruguayan girl Orfilia Juana, whom he married and had a son, Ernesto Carlos. From 1913 he decided to spend the last years of his life in Xerta with his wife and son at his home in Villa Retiro. Possibly the name of the house responds to its purpose. This property was an old house that Jaime ordered overthrow, although some of the foundations took advantage. The new construction would be an architectural revolution: a building of ground floor, first floor and terrace, built according to the new style of the time, modernism, with a special colonial touch. The house was completed in 1892. The owner was coming seasons until finally settled permanently 1913. So Villa Retiro was the final residence of Jaime just one year , since a year later in 1914, he died. His wife and son would be the heirs. After the death of Jaime Ernesto Carlos married his first cousin Ernestina, daughter of Ramon, his paternal uncle. This couple had two children: Jaime and Ernesto Marti Marti. July 1936, with the outbreak of the Spanish Civil War, the widow of Jaime Ernesto Carlos and his family decided to leave Xerta. They spent the first Civil War in Italy and then in San Sebastian. After the war, the family returned to the house, but found it in a deplorable situation since it had been used as military warehouse and shelter. Yet they returned to settle. The widow Juana died in Villa Retreat on 10 May 1960. The house became the property of his son who gave the estate to his eldest son Jaime. He married and had three children, residing in Villa Retiro practically all his life. In recent years he was spent in Pinell de Brai, with a daughter and where his wife still lives today. 2001 accepted the purchase offer of the Lopez family Gilabert, who bought the whole set with the intention of creating a hotel facilities. 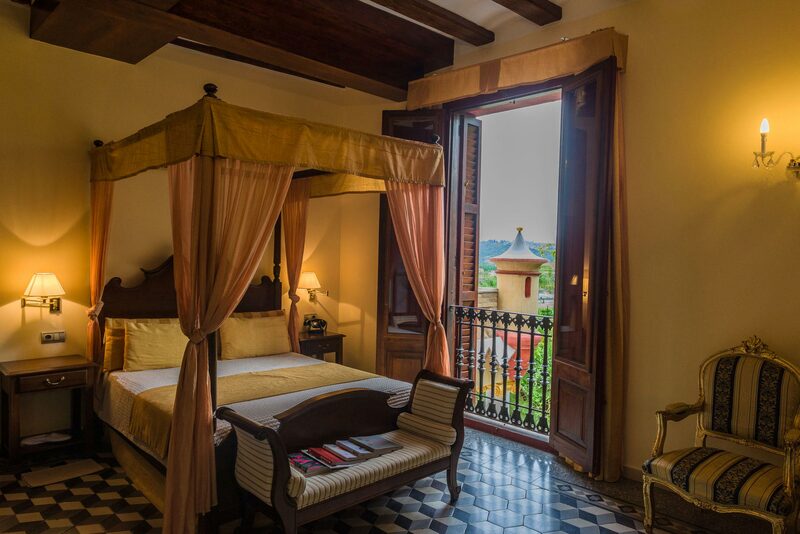 The new owners have remodeled so “Villa Retiro” to the point of making it a 5-star hotel. The new complex at all times respects the original architecture and the modernist style of the whole. In addition, it has recovered huge garden and installed a restaurant, the Villa Retiro 1*Michelin, taking advantage of the old buildings and recovering workers finally the splendor that one day the war has snatched. As regards the architect responsible for the construction, there are a number of indications that suggest that was in charge of Josep Fontserè,one of the Antoni Gaudí teachers and great representative of catalan modernism. Indeed, the type of construction and building supplements are very similar to other works of Fontserè, such as Parc Samà. Around the building, Jaime ordered to build a series of external accessories that helped urbanize the surroundings: gardens with tropical trees and a waterfall with a small lake. Also abroad they created an auxiliary warehouse and offices for workers, which include the construction of a well of oval shape and made of brick, wonder from the architectural point of view. Discover how was the opening of Hotel Villa Retiro in 2006.